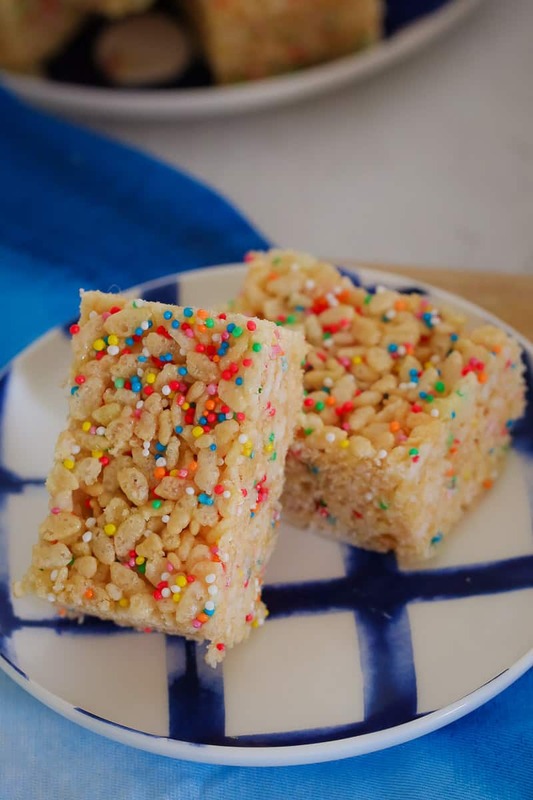 A simple 4 ingredient recipe for making healthier LCM Bars at home using just honey, rice bubbles, coconut oil and sprinkles! 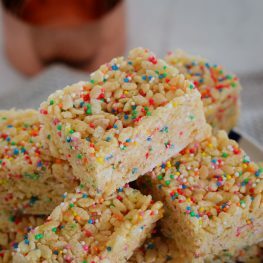 You know those rice bubble/marshmallow LCM bars that you can buy from the supermarket?? They’re absolutely delicious… But they’re not exactly the healthiest option going round (insert sad face here). These healthier LCM Bars are a yummy alternative to the store-bought version. 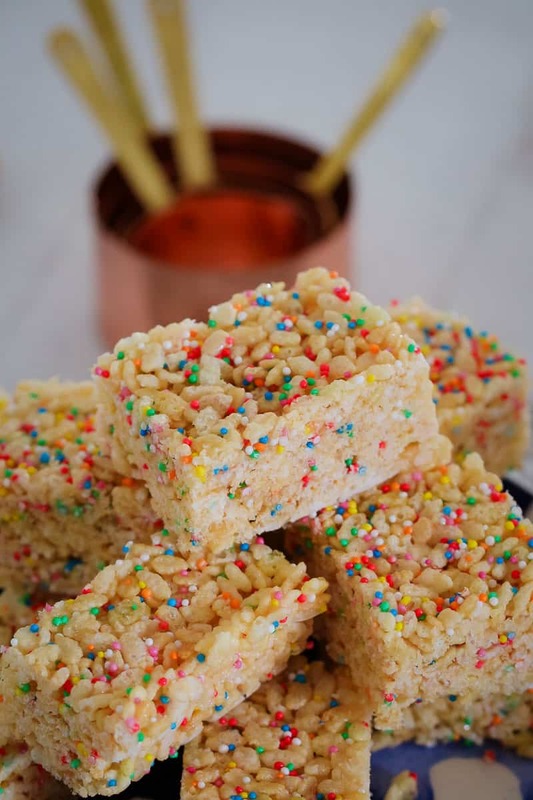 They’re made with just 4 ingredients – honey, rice bubbles (or any puffed rice), coconut oil and sprinkles. How easy is that!? Plus they take a whole 5 minutes to whip up. 5 minutes!!!?? That’s nothing, right!!? The only downside to these healthier LCM bars is that they’re not lunch-box friendly. Why, you might ask? They don’t have any nuts in them?? Well it’s because this slice needs to be eaten straight from the fridge. If you let it come to room temperature, the honey and coconut oil will melt and the slice will crumble. 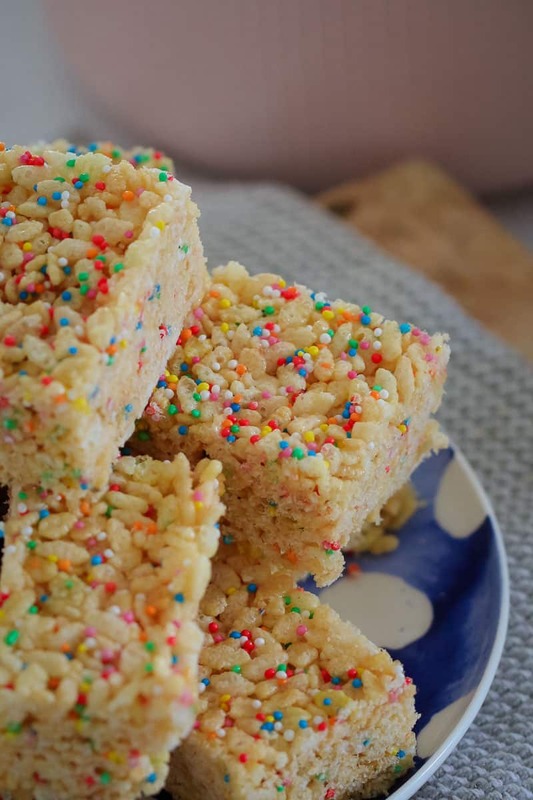 But if you eat it cold from the fridge, you’ll have a delicious crispy slice… YUM! 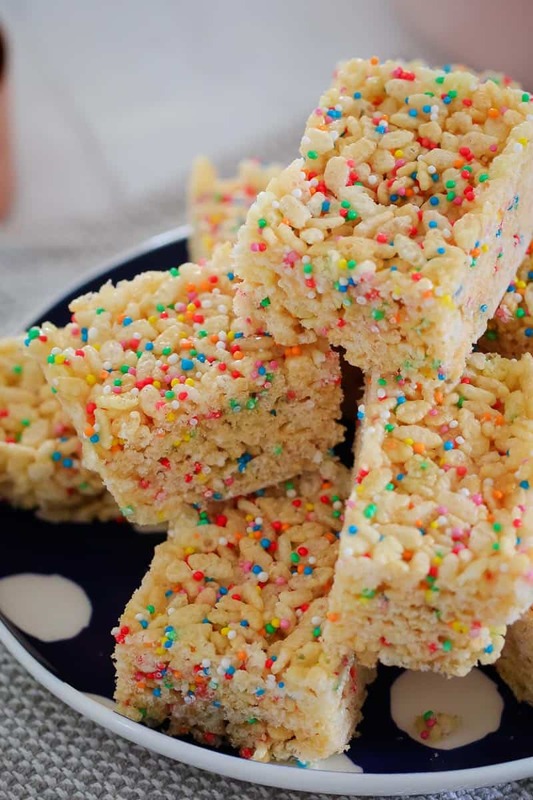 So keep this recipe for after-school or weekend treats. This is such a great recipe to make with kids. It’s simply a matter of popping the ingredients into a large bowl, mixing them together and pressing down firmly into a tin (check out my video below for the best tip for getting your slice pressed nice and firmly into the tin). My little Will did a great job stirring everything together (and eating a couple of mouthfuls while I wasn’t looking!!). 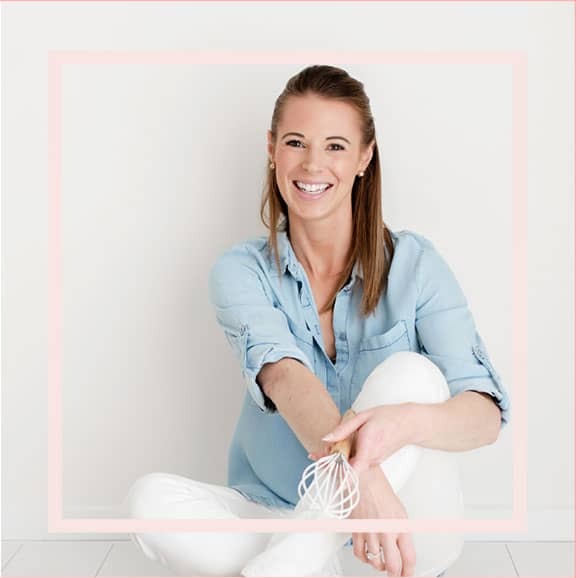 If you love the sound of these Healthier LCM Bars, make sure you check out my Healthy Coco-Pop Bars too!! Grease and line a 20cm X 20cm square cake tin with baking paper. 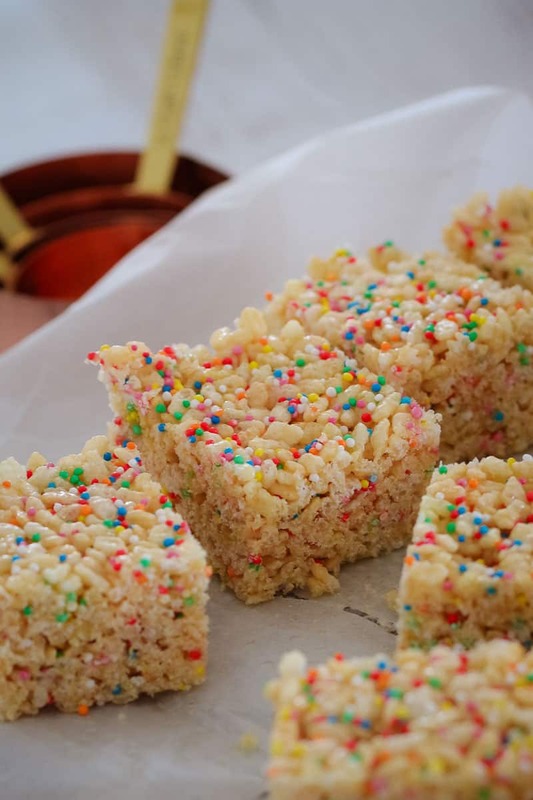 Place the rice bubbles, honey, coconut oil and sprinkles into a bowl and mix together really well (the rice bubbles should all be coated with the honey and coconut oil). Spoon the mixture into the prepared tin and press down firmly (see notes). Add extra sprinkles. Place into the fridge for 2-3 hours or overnight. Cut into slices straight from the fridge (with the slice still in the tin). Store in the fridge for up to 5 days (or freeze for up to 1 month). Serve straight from the fridge (see notes). Use a cake tin of the same size to help press the mixture down firmly. It's important that the mixture is pressed down very firmly so that it doesn't crumble when sliced. Remove the slice from the fridge and cut immediately (if you allow it to come to room temperature, it will crumble on slicing). Cut the LCM bars with a very sharp knife while the slice is still in the tin. Place the slice pieces back into the fridge as soon as you've cut them (to keep them intact). 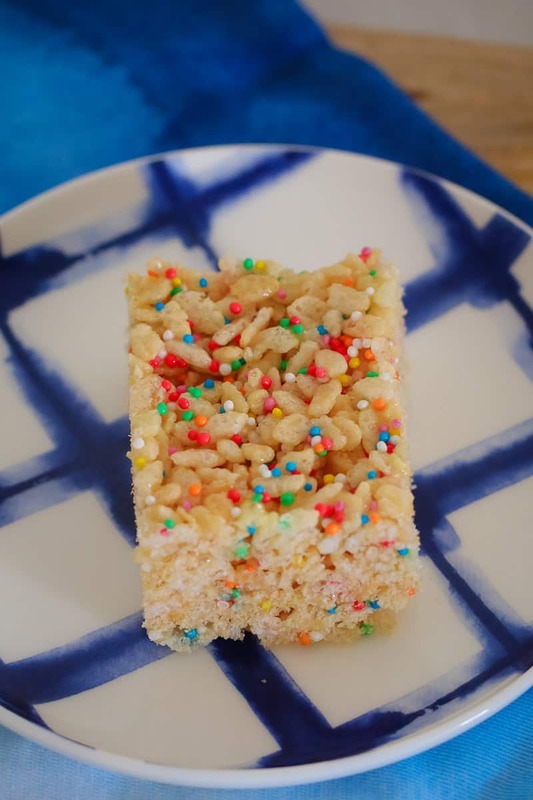 This slice must be eaten straight from the fridge (it will crumble/melt at room temperature (I wouldn't recommend it for lunch boxes... but perfect for an after school treat!). What could the honey be substituted for to make them suitable for under 1s? I’m thinking rice malt syrup or maple syrup, but don’t want them too sugary. And would it be 1:1 swap?